Today I’m heading off to even more AmeriCorps training in Trout Lake. We’re spending two nights there, driving down today and back Friday night. Expect silence through at least Saturday; Trout Lake is quite remote, and although they do have computers with internet (amazing! ), the AmeriCorps people work hard to keep us busy to make the trip worth the drive. I still wonder why they picked Trout Lake. It’s central to Washington and Oregon, true — centrally inconvenient for anybody not living in Hood River. I hear it’s pretty, but our 10-day stint in January didn’t reveal much of that; perhaps this time, or the time in July, will have less ice, snow, and rain, and more views of Mt. Adams. All that said, I don’t mind a few days away from my normal internship. Even taking a day off here and there, I feel generally useless, discouraged, and like I’m just treading water — not making any progress. Maybe it’s more accurate to say I only feel I’m making extremely slow progress — not quite none at all, but an almost imperceptible amount. Anyway, all that to say I’m off gallivanting around. Expect photos and not many words when I post next. Herding all those cats into one group for the big parade walk to Safeco Field. I encouraged people to wear bike helmets to look like a group, but most people were too self-conscious to actually do it. 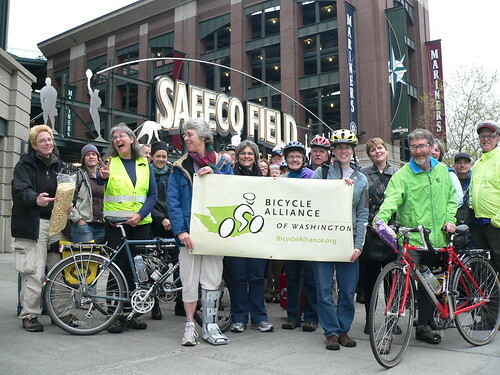 That’s 49 Bicycle Alliance volunteers and staff, already enjoying themselves before the game even started. I deem it a success. 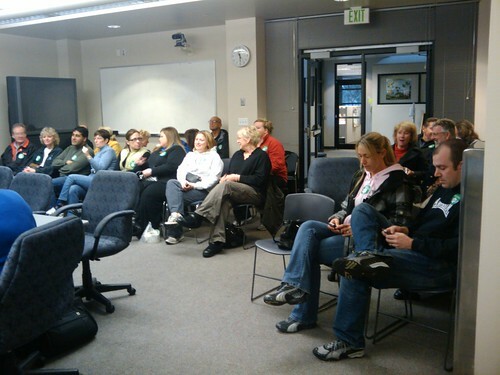 These are pictures from the Kirkland City Council Study Session on off-leash areas. This is the big meeting we were trying to use my door hangers to advertise and encourage people to attend. 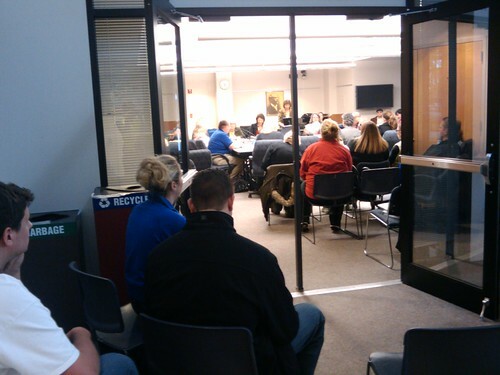 Total KDOG member attendance: 37 — too many to fit in the meeting room! I think I have about 25 door hangers left out of the 750 I received on March 23. Not too shabby for barely 2 weeks of scrambling around. One of those listening was a woman named Lydia, a dealer in purple cloth from the city of Thyatira, who was a worshiper of God. The Lord opened her heart to respond to Paul’s message. A couple weeks ago, I spent quite a few hours working really hard on an email newsletter for KDOG, the group I’m doing my Community Action Project with. On Monday, March 29, at 4:05 pm, I triumphantly finished it and emailed it to the KDOG mailing list through my Bicycle Alliance account. I felt a little thrill of excitement at having shared something I worked so very hard on with all those people. I also hoped it would get a few people to come out and help distribute door hangers on Saturday, April 3. I never heard anything about the newsletter after I sent it out, but I got busy and it slipped my mind. That is, I forgot about it until Sunday, April 4, when I received an email from one of the KDOG leaders. She asked when I was planning on sending the newsletter out. As you can imagine, my heart sank. I immediately scrambled around desperately for confirmation that I had, in fact, sent the newsletter. That’s when things started getting strange. I realized that I never received the newsletter to my gmail account, which is the one that gets KDOG notifications. Then, when I checked my work email Sent Items folder, I didn’t have a record of having sent it to the KDOG mailing list. However, I had cc’d my work email on the newsletter, and that email indicated it had been sent to the correct mailing list. Also, the Meetup.com Mailing List page had no record of the newsletter going out last Monday, and the two leaders never got it. Eventually, through some trial and error, we figured out that Meetup.com only allows email address on the mailing list to send emails to the mailing list. That means that the newsletter I sent out through my work email — which is not registered with Meetup.com — never reached the intended recipients. I never got a notification that anything had gone wrong, or that my email had not arrived at its intended destination. It was only Ian commenting about the different email address thing that made me realize sending it through work might have been a problem. I re-sent it this morning through my gmail account and immediately got confirmation that it worked. Even though I got it sent out this morning, I spent the entire last week thinking I’d done a great thing when in reality I had completely failed. I feel very disappointed about this. I could very well have gotten a decent number of people to meet me on Saturday, and maybe have finished getting all the door hangers hung, if the newsletter had gone out as intended. Also, the newsletter talked about the extremely important meeting on April 6, and strongly encouraged KDOG members to attend the meeting. Now it’s such late notice that I doubt my sending it today will make any difference. On the bright side, at my last count, I have fewer than 100 KDOG door hangers left out of the 750 I originally received. I don’t know what people and businesses have done with them, but I’ve certainly done my part as far as organizing people to distribute door hangers goes. Also, 4 people did come to the Saturday meeting. This has been a learning experience for me in many ways. Now I know to confirm that the email went out with somebody on the mailing list; to plan events farther in advance and ask businesses for food donations at least 1 month ahead; and that personal connections are the best way to get people to help. Next time I will also post the volunteer opportunities not just on the KDOG Meetup page, but with United Way of King County, other dog groups in the area, and the Kirkland Reporter if possible. So, even if the newsletter may not have served the purpose I intended, I’ve learned some about organizing events and volunteers. And that’s probably more valuable in the long run than having sent out one particular newsletter. “Do men make their own gods? This is one thing I’m working on these days. 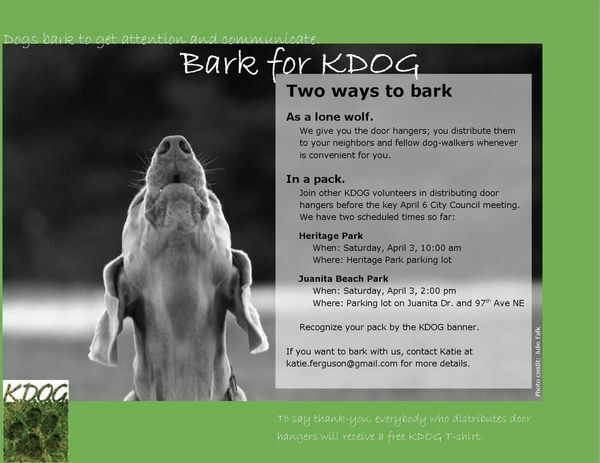 If you’re here April 3rd, I would sure love some volunteer help distributing KDOG door hangers. More details here and here. There was a man named Cornelius who lived in Caesarea, captain of the Italian Guard stationed there. He was a thoroughly good man. He had led everyone in his house to live worshipfully before God, was always helping people in need, and had the habit of prayer. So I’m sorry if you had something else you wanted me to think about. My memory and processing power are all used up, and you’ll just have to wait until I complete some tasks and free up some space. What’s filling my brain? Why, thank you for asking! House hunting. Holy mackerel, there’s a lot to think about with purchasing a home. We landed with Linnea Jones as our realtor, and one hour with her convinced me that she’s going to be a huge asset in our house hunt. She’s an expert we can rely on, and I’m really glad to have that resource. Financial details. In addition to paying for the home we choose (yesterday we got a pre-approval letter from Cobalt Mortgage, the financial people Linnea recommended, and somehow seeing those numbers on a piece of paper makes it feel so much more real), we also have to think about details like the fact we don’t actually have any furniture. Bike repair. Of course, the struggle to obtain money from Hertz to repair my bike continues. I haven’t heard anything since the adjustor came by last Thursday, even though I called the Hertz guy Monday morning. I also have to choose a shop to do the work, which is tough since I don’t have relationships with any shops like I did with Landry’s. KDOG activities. Yesterday evening I picked up 750 free KDOG door hangers printed by Leatherback Printing. Now I have to organize volunteers to distribute them all — before the Big City Council meeting on April 6th. AmeriCorps activities. Of course, I can’t leave out AmeriCorps! I’m working with another intern to plan the Pod meeting that takes place in Othello on April 2nd. Also, on Friday Every and I have a site meeting with the gal in charge of the interns, and I have to have a self-evaluation filled out by then. Internship activities. Let’s not leave out my job; I have a new volunteer coming for training tomorrow, and another prospective volunteer to prepare materials for, and training materials to prepare, and a commute brochure to finalize and get printed, and a 10 to 12 minute REI commuting seminar to prepare for early April. LCI activities. I’m co-teaching a Traffic Skills 101 class in late April, and of course that requires serious prep… If I can squeeze it in among all the other stuff. Church volunteering. I’ve agreed to start volunteering at Journey Church at some point. I’m assuming that will start in the next month or so, too. All that said, I think it’s clear I may be feeling a little stress and that the chaos may be getting to me. However, I’m blessed with a commute that soothes many ills. At work, I’ve been doing research on policies for “hiring” and “exiting” volunteers. The Bike Alliance doesn’t have any such policies even for staff that I can find (caveat: I’ve looked, but they could exist somewhere I’d never search. Asking staff for help is on my list), so it looks like I’ll be writing them myself. The fist section should contain consice and claer information about the purpose of the policy and its limitations must be clearly stated. Frankly, I’m not sure I should trust that web site’s volunteer policy advice. Author KatiePosted on March 23, 2010 March 23, 2010 Categories AmeriCorps, Bicycle AllianceTags AmeriCorps, Bicycle Alliance, volunteerLeave a comment on For Reals!